I was lucky enough to find the perfect room at Urban Haven in Montréal. My generous hostess, Carolyn, turned me on to the lovely coffee shop with homebaked treats just steps from her front door. I happily let Café Soufflé become my afternoon treat & café au lait stop while I caught up on email. Café Soufflé is the home to Marie-Josée and Brigitte Anne and their very creative baking. Sinful brownies, fabulous tarts & muffins (poppyseed pear and strawberry white chocolate…not your everyday boring muffin). I was most impressed by the best homemade toffee I’ve had the pleasure of letting melt in my mouth (don’t miss the creation with masala chocolate). On my last visit to the café on the corner there was a beautiful lemon tart sprinkled with nuggets of bright green pistachios… delightful. 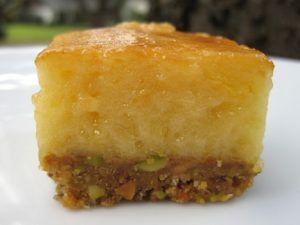 My inspired version of Lemon Curd Bars with Pistachio Graham Cracker Crust has satisfied my lemon cravings… but the Montréal atmosphere I just can’t recreate. Preheat oven to 350 degrees. Butter an 8-inch square baking dish and line bottom with parchment paper, leaving a 2-inch overhang on two sides. In a food processor, grind pistachios with graham cracker crumbs and sugar. Blend in butter. Press mixture into bottom and 1 inch up sides of prepared pan. Bake until lightly browned for 8 to 12 minutes. Set aside to cool. To make the lemon curd, add enough water to a medium saucepan to come about 1-inch up the side and bring to a simmer. Combine egg yolks and sugar in a medium size metal bowl and whisk until smooth. Measure lemon juice and if needed, add enough cold water to reach 1/3 cup. Add juice and zest to egg mixture and whisk smooth. When water reaches a simmer, reduce heat to low and place bowl on top of saucepan. Whisk until thickened, approximately 8 minutes, or until mixture is light yellow and coats the back of a spoon. Remove from heat and stir in butter a piece at a time, allowing each addition to melt before adding the next. Pour filling into cooled crust. Bake for 15 minutes or until set. Cool in pan on rack; then chill at least 1 hour before serving. Using parchment paper as handles, lift out of pan and transfer to a cutting board. Cut into 16 squares, wiping knife with a kitchen towel between each cut. To store in refrigerator, cover with plastic wrap.